The Hawaii Geographic Information Coordinating Council (HIGICC) is a private non-profit organization consisting of members of Hawai'i's geospatial community. Our goal is to provide coordination of geospatial activities among a wide range of users in order to avoid duplication of effort, promote data sharing, and maintain data standards throughout the state. HIGICC provides opportunities to network with other GIS professionals in Hawaii and the Pacific. Donations can be directed towards the Mark Lierman Scholarship, GIS Day activities, or the HIGICC general fund. Are you a student using geospatial technologies to further your studies? HIGICC is pleased to announce that we are now accepting applications for the 2019 Mark Lierman Memorial Scholarship. This $1,000 scholarship is awarded annually to a current college student who has demonstrated an appreciation for and understanding of geospatial data and GIS. The applicant must be enrolled at an accredited college or university and either be attending in Hawaii or have graduated from a high school in Hawaii. Last year’s recipient, Eszter Collier, a graduate student at UH Hilo, applied her scholarship to her research in mapping biological soil crusts with very high resolution imagery. The scholarship application deadline is June 14, 2019. Visit the HIGICC website at www.higicc.org/awards for more information! King Tide Photo Surveys next week! New and improved photo submission platform! King Tide Photo Surveys are next week! Join our amazing team of citizen scientists in the Hawai’i and Pacific Islands King Tides Project and help us document the impacts of King Tides (the highest high tides of the year). These elevated water levels provide a glimpse into the future of what our shorelines may look like on a more regular basis with rising sea levels. Visit the project website, www.PacificIslandsKingTides.org, for peak high tide times at locations across the Hawaiian Islands (Aug. 9th and 10th, 2018). We are excited to announce the launch of our new more used friendly photo submission platform! This platform developed in collaboration with the Pacific Islands Ocean Observing System (PacIOOS) allows for faster and more streamlined submission of King Tides photos and observations. Check out the new photo platform here! Thank you for your participation! Your photographs are a valuable resource for helping scientists and decision makers better understand and prepare for sea-level rise. Last year with your help our free and publicly accessible database reached a total of 2,400 photos. Help us reach our goal of 3,000 photos this summer! You're invited to join us at the HIGICC O'ahu Geospatial Expo at the Hawaii State Capitol. There will be presentations from local, county, state and federal GIS professionals. The Expo starts at 8:45AM and goes to 3PM. Event is free! Attendees can go downtown and enjoy a wide variety of lunch options. here are links to the presentation and supporting documents. Thanks to the Census Data Specialist Eric Coyle. His expertise and presentation skills were greatly appreciated. Aloha, time for the 2018 Higher Education Scholarship. The HIGICC is glad to offer the $1,000 scholarship to a deserving college or university student doing studies or projects here in Hawaii. Please forward this announcement and application on to students and teachers. Women In Technology STEMworks™ is pleased to announce the 2018 Hawaii STEM Conference on April 10-11, 2018 at the Hawaii Convention Center on Oahu, Hawaii. This two-day regional technology conference serves 1000 middle and high school students and 300 teachers. The students are part of our STEMworks™ labs that are located in twenty-nine schools across the state of Hawaii. The Hawaii STEM Conference provides our STEMworks™ students the opportunity to showcase their service-learning STEM projects, network with other students and industry professionals, compete in competitions, attend hands-on STEM sessions, and much more. We also provide a professional development track for teachers. The Hawaii STEM Conference provides students and teachers the opportunity to receive training in cutting-edge software/tools and be exposed to new STEM fields and career opportunities. Past conference breakout sessions: Photoshop, After Effects, Gaming, Coding, Engineering Design using CAD, Voyaging, GIS/GPS, Mapping, UAV’s, Conservation, and Photography. For a complete list and past agendas, please visit: www.HawaiiSTEMConference.com. The Hawaii STEM Conference would not be possible without our valued industry partners who dedicate their time, expertise and knowledge to help inspire the next generation of STEM professionals. We greatly appreciate your support! We are excited to invite industry professionals to participate in our STEM Career “5×5” session on Tuesday, April 10, 2018! Question: What is the 5×5 Session? Answer: The “5×5 Session” is a high energy networking session that offers students a unique opportunity to ask you about your personal experiences, career and college pathways, and much more are explored during this engaging event. It’s a platform designed for middle and high school students across the state to engage with you for 5 minutes of 5 rounds. You will be joined in with both local and national STEM industry professionals to inspire students. This 5×5 Session is incredibly popular among the students to gain interest in the STEM fields. Many of the questions commonly asked are: What type of education do you have? What is the coolest project you have worked on? What do you enjoy most about your job? What made you choose your career? Etc. Here is a link to the recent UAV webinar. Lots of new possibilities, and it is here and now. 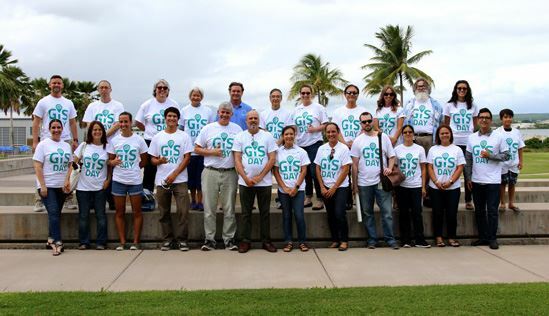 Aloha, GIS Day 2017 was a great success. In collaboration with the MEDB WIT team and NOAA, the HIGICC participated with over 30 volunteers. Lots of different school groups attended. Shout out to Molokai HS for making the effort to come over and join in. Winter King Tide Photo Survey! It is time again for GIS Day. 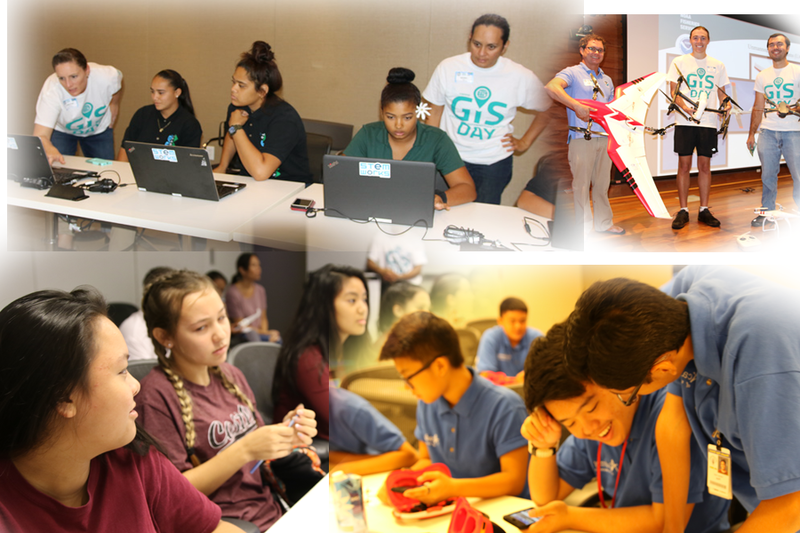 Please consider volunteering for the morning to promote GeoSpatial technology and GIS to Hawaii school students.